"Two thirds of the EU population live in cities, which are decisive for social cohesion and economic development. Therefore cities need adequate frame conditions to boost investment in affordable housing," as Vienna's Mayor Michael Ludwig affirms: "The 'Partnership on Housing' has developed concrete legislative proposals for the EU Commission, which will be presented in Vienna. Now Europe must take measures to combat undesirable developments in the housing markets." There are over 220 mln households in the EU - but fully 82 mln Europeans have problems finding access to affordable housing, as housing prices and rents in cities have for years been rising massively. The EU "High-Level Task Force for Investing in Social Infrastructure in Europe" estimates the investment gap regarding affordable housing at around Euro 57 bln annually. n 2016, the "Urban Agenda for the EU" was launched by the EU Council with the objective of strengthening cities in the EU governance process. The conference "Housing for All" provides the conclusion to the EU Urban Agenda - Housing Partnership. The catalogue of measures now presented comprises numerous already implemented outcomes - e.g. studies on the housing situation in EU Member States or a database on effective housing projects. It also includes important recommendations addressed to the EU legislator. The major share of funding for social, public and affordable housing stems from grants at the national and local levels and from users. But European legislation exerts a massive impact via EU state aid provisions and fiscal rules. It is therefore demanded that e.g. the target groups for subsidised housing should no longer be exclusively restricted to "disadvantaged citizens or socially less advantaged groups". Moreover, the indicator of the portion of a household's income which is spent on housing should be drastically reduced from currently 40% of the total household income to 25%, as the cost of living has increased, without incomes growing to a comparable extent. he Austrian capital plays a pioneering role on an international scale: 62% of Vienna's inhabitants live in 220,000 municipal flats or over 200,000 subsidised flats. However, due to the continued real-estate investment boom, Vienna, too, is faced with major challenges. 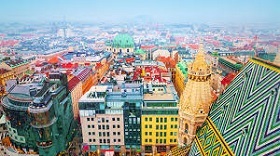 For this reason, Vienna's city government recently set a legal two-thirds quota by introducing a new land zoning category in the latest amendment to the Vienna Building Code, which met with positive reactions on an international scale as well. In the future, large-scale real-estate projects will have to comprise more subsidised dwellings than privately financed flats. "In this way, we prevent land speculation and reassure the citizens of Vienna that housing in their city will remain affordable," as Kathrin Gaál, City Councillor for Housing and Women's Issues, concludes.